If you’re a follower of my recipes here at Recipes Worth Repeating, you know how much I love my Instant Pot! Want to know how much? Check out a post I put together featuring 14 Recipes That Will Convince You to Buy An Instant Pot. And what’s funny is I almost didn’t buy one. I read a lot of reviews/experiences from people who tried to use their Instant Pot and just didn’t like it at all. But, I have a friend who swore by her Instant Pot so I jumped on the bandwagon and bought one. And I’m SO glad I did! 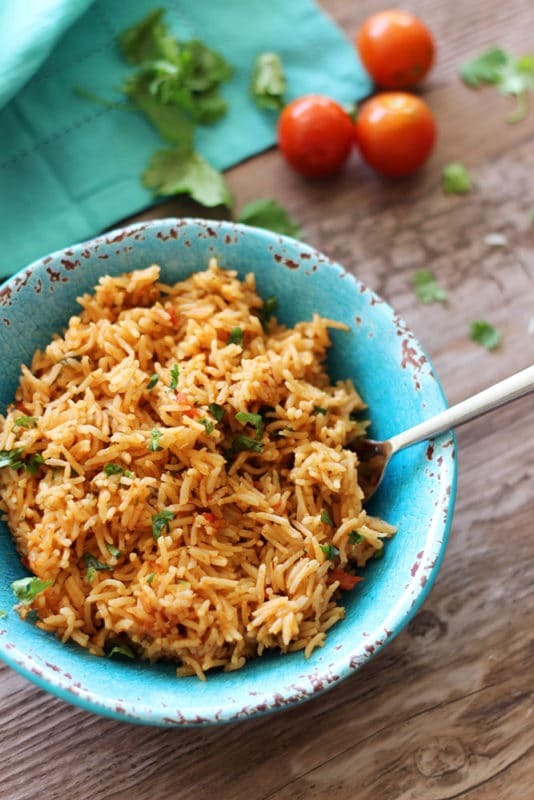 Ya’ll, this fast and easy Instant Pot Mexican Rice dish is delicious! I’m talking fresh garlic, chopped onion, crushed tomatoes, cilantro, cumin, garlic powder, smoked paprika, long grained white rice, avocado oil and chicken stock. Pretty SIMPLE ingredients! I’m going to walk you through this process step-by-step because let’s be honest…a lot of Instant Pot recipes are too vague and I get confused! Not this one..nope! I’ve got you covered on this recipe! Here we go! On your Instant Pot, click the Saute button. The display screen should reflect “On”. Once your Instant Pot heats up and is hot (about 3 minutes from putting it on Saute mode), you’ll pour in the avocado oil. Next, you’ll add in your chopped fresh garlic and onion and saute. 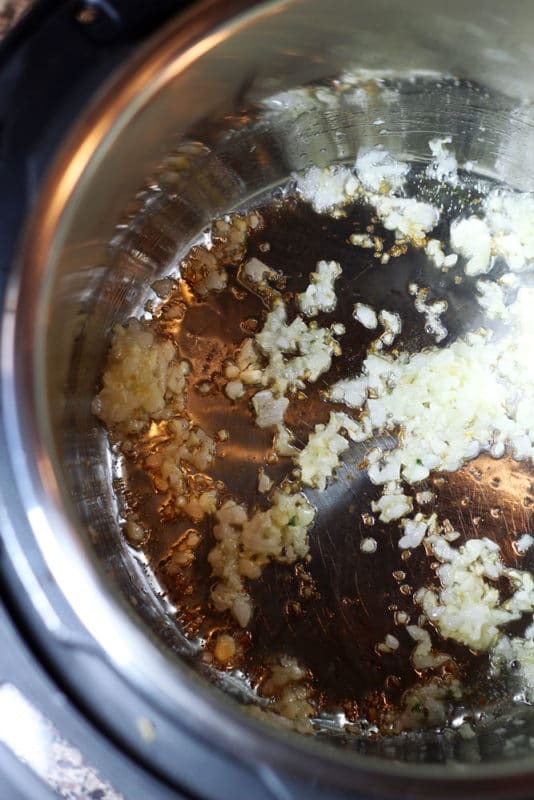 I saute for about 3 minutes or until my garlic and onion start to slightly brown. From there, you’ll add in your uncooked long grain white rice. You’ll want to stir the rice around until it’s well coated with the oil, garlic and onion. Next, you’ll add in the chicken stock, crushed tomatoes, chopped cilantro, cumin, smoked paprika, garlic powder, salt. 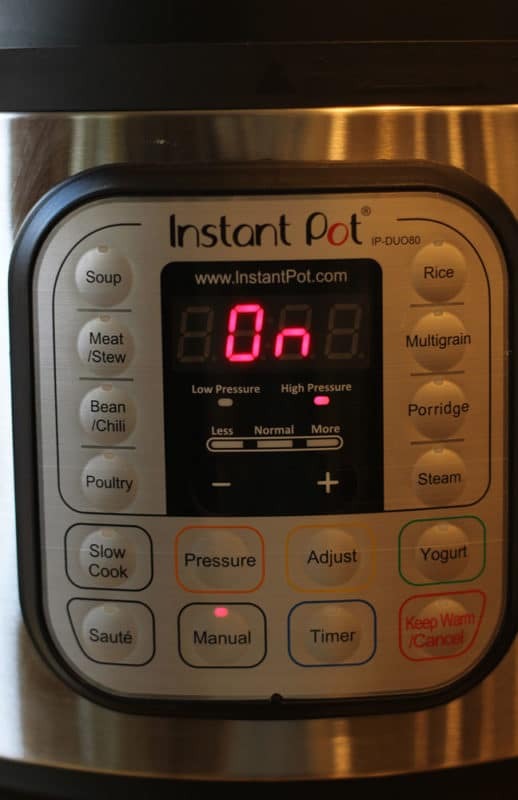 You’ll now want to turn off your Instant Pot by clicking on the Keep Warm/Cancel button. You’re now ready to pressure cook your Mexican Rice! Place the lid on your Instant Pot and twist it so it locks in place. Make sure your knob is set to the sealing position. Now, click on the Manual button. Notice your display screen reflects “On”. Using the + button, click until your display screen displays 8 minutes. Note that I’m cooking on High Pressure. During the 8 minute cooking time, your Instant Pot is going to start steaming and whistling a bit. This is normal. You’ll also notice that your display has started counting down from 8. Once the Instant Pot counts down to 0, it will beep. 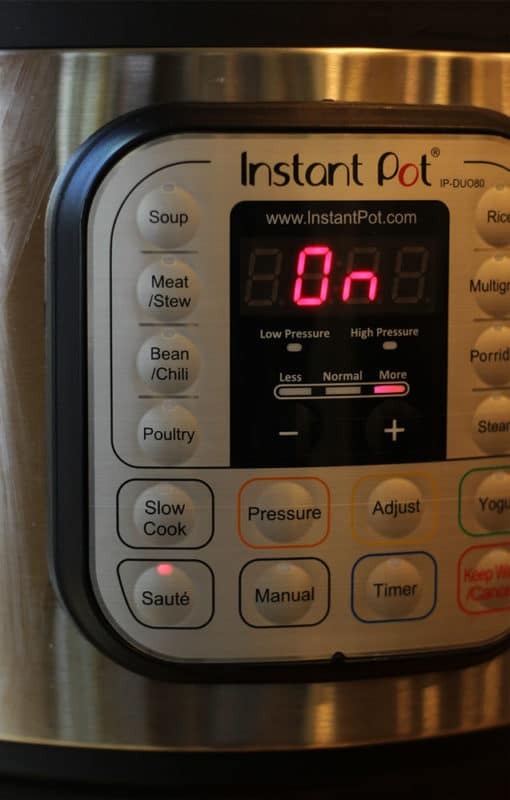 From there, your Instant Pot will need to count down for 5 minutes. During this step, the Instant Pot is slowly releasing pressure. Once you hit 5 minutes, you’re going to twist the pressure knob to release the pressure. Steam will shoot out once you move the valve to venting mode so be careful! After the steam has fully released, you can remove the Instant Pot lid. 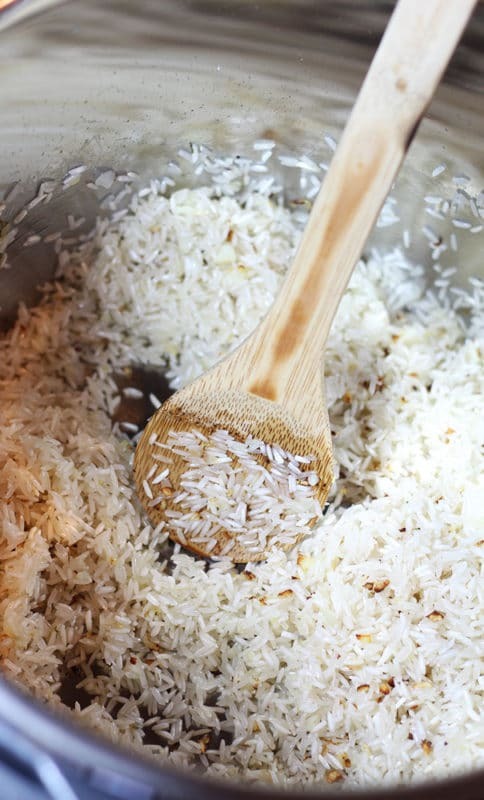 Take a fork and lightly fluff through your rice. From there, you are ready to serve! Super easy right?!? To Rinse Or Not To Rinse? 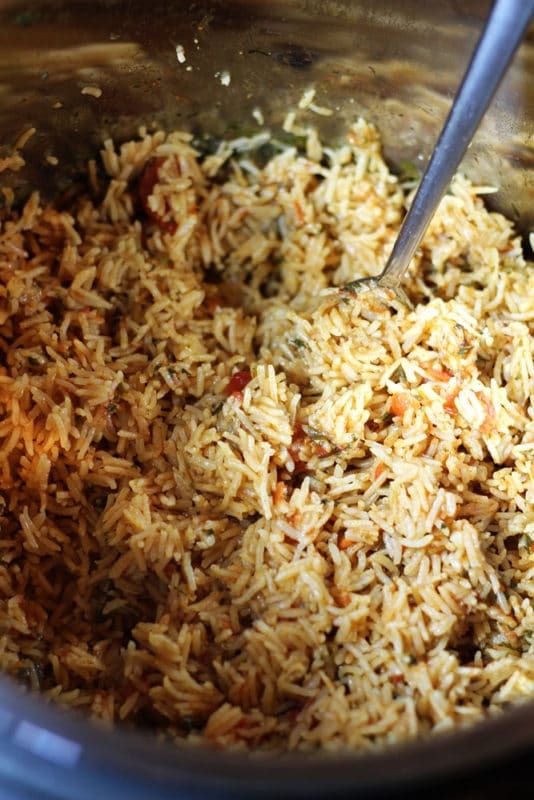 – When making this recipe, I don’t always rinse my rice before I start cooking it. You can if you want. Some rice recipes, like my How To Make The Best Instant Pot Rice, I do because I can actually taste the starch. Not so much with this recipe. Instant Pot Versions – Did you know there are different Instant Pot versions/generations? I’ve been told that cook times differ based on the version of Instant Pot you own. I have the Instant Pot IP-DUO80 7-in-1 Programmable Electric Pressure Cooker, 8 Qt. 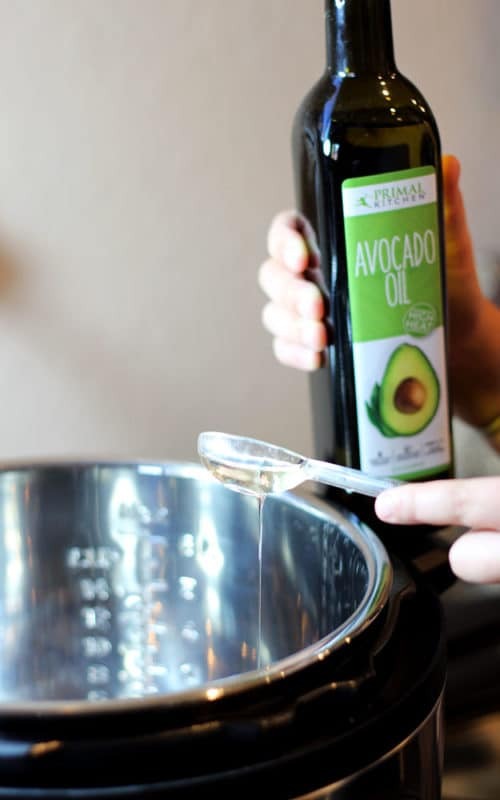 Best Oil To Use – I chose to use avocado oil in this Mexican Rice recipe because it’s a good quality oil, it’s considered a healthy fat and it does REALLY well with high heat! 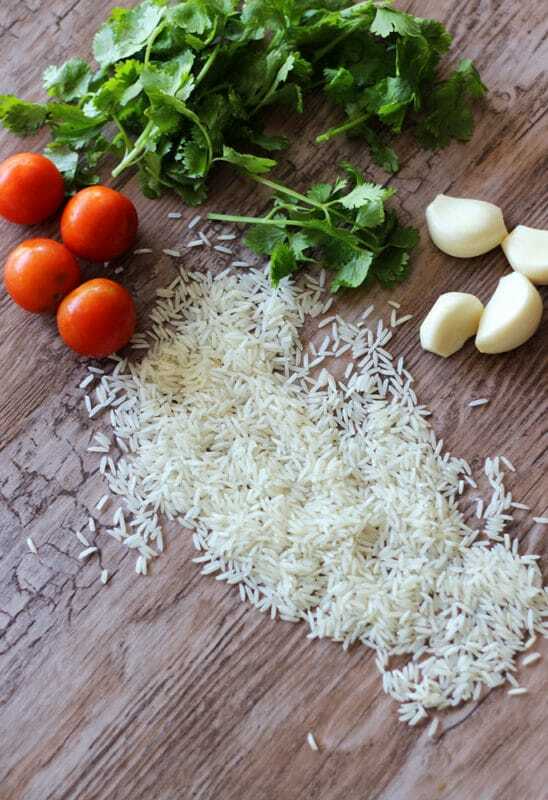 Toppings – I top my Mexican Rice with fresh chopped cilantro and sun-dried tomatoes! Fresh – This recipe is best when made fresh! What Other Instant Pot Recipes Can I Make? 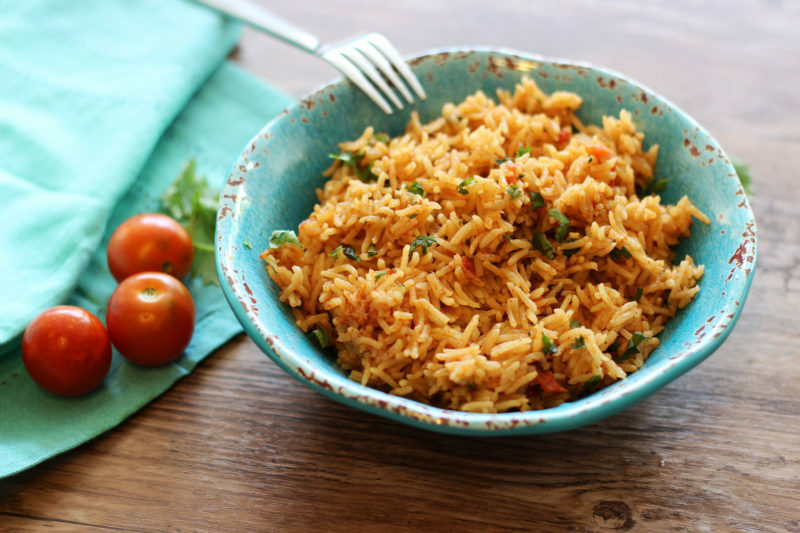 Full of traditional Mexican flavors, this Instant Pot Mexican Rice dish pairs perfectly with so many main dishes! 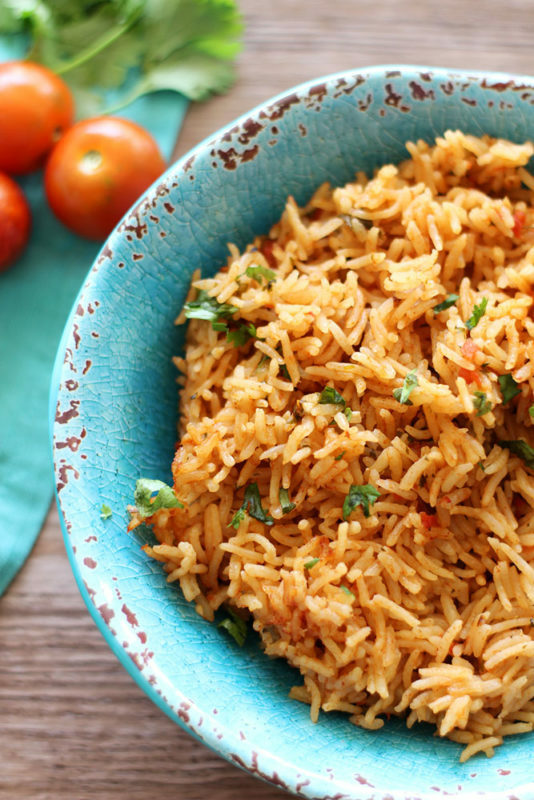 By using your Instant Pot, you’ll create your Mexican Rice in a matter of minutes and you’ll never want to revert back to the old-fashioned way of making it on the stove top! Enjoy this one guys…it’s fast, easy and DELISH! And if you don’t have an Instant Pot yet and want to jump on the bandwagon with the rest of us, you can buy it on Amazon here: Instant Pot. Enjoy! FOLLOW ME on Facebook, Twitter, Instagram and Pinterest because I’m CONSTANTLY posting recipes that I know you will love! Oh, and share the love by sharing this recipe to your favorite social media channels! 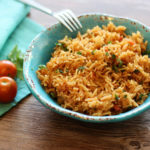 If you’ve tried my recipe for Instant Pot Mexican Rice, rate the recipe and leave me a comment! 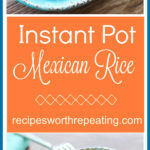 The most amazing Instant Pot Mexican Rice side dish made in 15 minutes! It's so easy and effortless, you'll never want to revert back to the old-fashioned way of making it on the stove top! Plug in the Instant Pot and set to Saute mode. When your Instant Pot is hot (about 3 minutes later), add in the avocado oil. Next, add in the chopped garlic and onion. Saute for about 3 minutes, or until the garlic and onion start to turn brown. Then, add in your uncooked long grain white rice. Stir the rice around until it's well coated with the oil, garlic and onion. 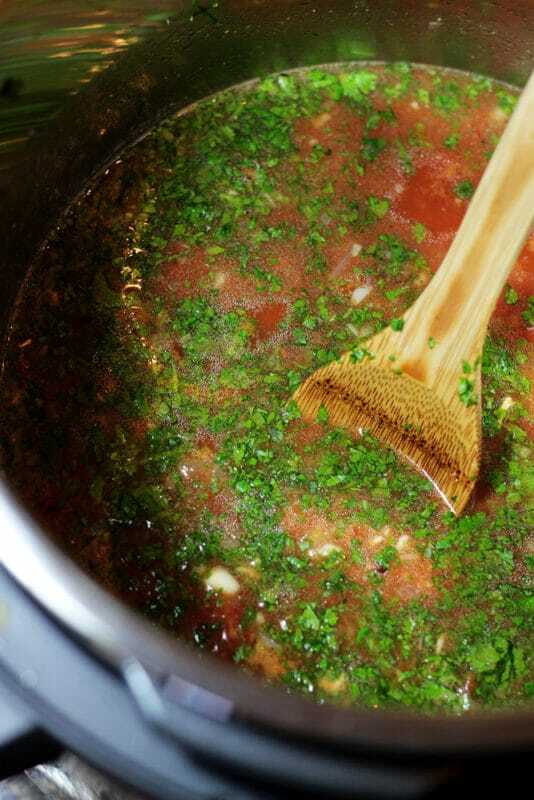 Add in the chicken stock, crushed tomatoes, chopped cilantro, cumin, smoked paprika, garlic powder, salt. 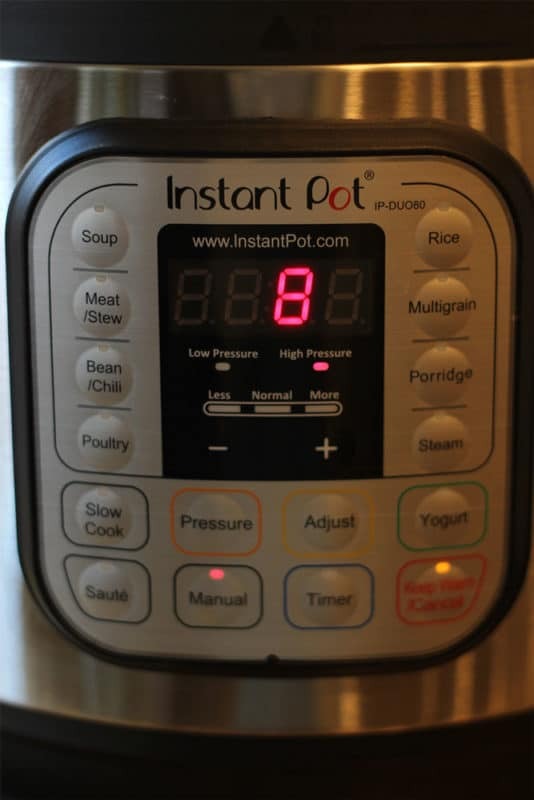 You'll now want to turn off your Instant Pot by clicking on the Keep Warm/Cancel button. Place the lid on your Instant Pot and twist it so it locks in place. Make sure your knob is set to the sealing position. Click on the Manual button. Notice your display screen reflects "On". Using the + button, click until your display screen displays 8 minutes. Ensure you are cooking on High Pressure. You'll also notice that your display has started counting down from 8. Once the Instant Pot counts down to 0, it will beep. 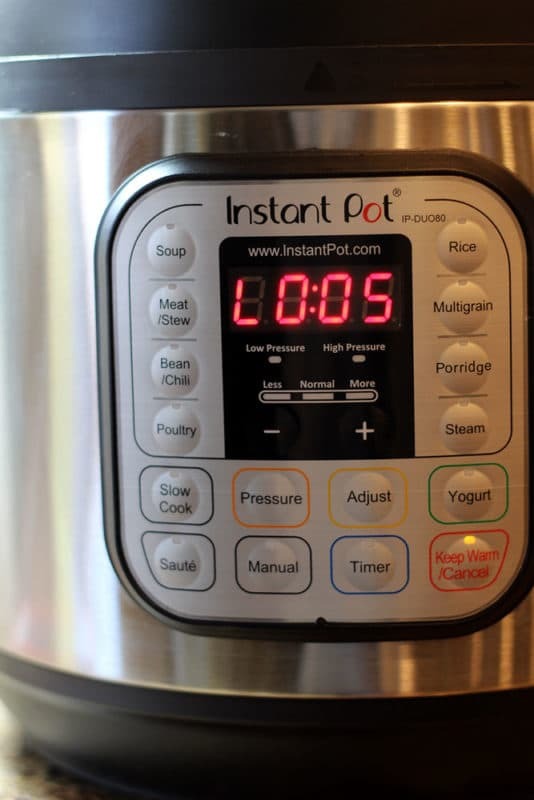 From there, your Instant Pot will need to count down for 5 minutes. During this step, the Instant Pot is slowly releasing pressure. Once you hit 5 minutes, you're going to twist the pressure knob to release the pressure. 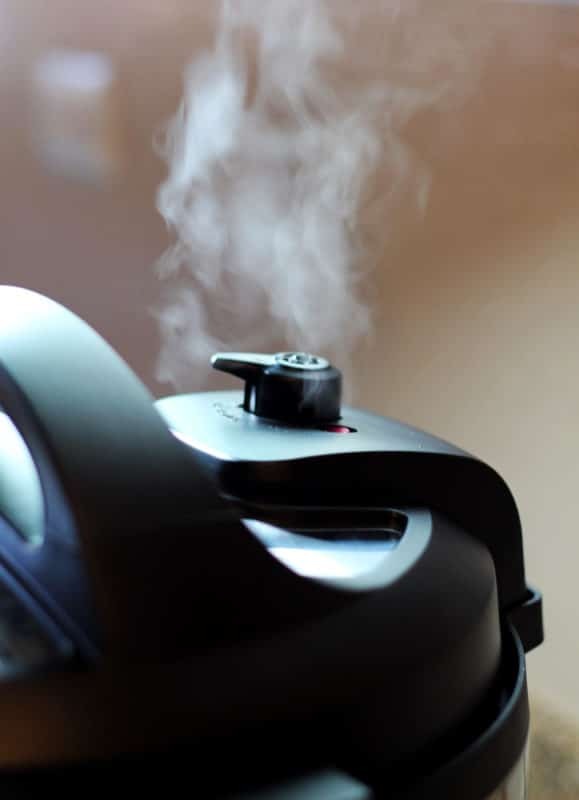 Steam will shoot out once you move the valve to venting mode so be careful! After the steam has fully released, you can remove the Instant Pot lid. Take a fork and lightly fluff through your rice. Top with fresh chopped cilantro and sun-dried tomatoes! Update Notes: This post was originally published in August of 2017, but was republished with new photos, step-by-step instructions and tips in April of 2018. Love love love this recipe! So fast and easy and everyone loves it. I’ve made it 3 times in the last few weeks for group get-togethers and everyone raved about it. I have a lot of vegans in my family so substituted Orrington Farms Vegan chicken flavored broth and it tastes amazing! I’m sure vegetable broth would work too but that chicken flavor makes the dish I think. I didn’t have canned tomatoes so substituted salsa and it was perfect! Thank you!! Thank you so much for taking the time to respond!! I’m so happy that you love this rice!! I love the addition of salsa – GREAT idea!!! I am so glad you loved it! Your additions sound great! Thanks for letting me know it turned out so great!! Enjoy those leftovers!! It came out tasting fantastic, but I got the burn error before it came to pressure. The rice was nearly done anyway at that point, somehow, so I just turned it off, scraped as much of the stuck-on rice as I could from the bottom, and placed the lid back on top for a few minutes because I had something else to do just then. Apparently there was enough residual heat and moisture to finish cooking the rice, and I’m enjoying leftovers today. I’d really like to make this for an upcoming family potluck, but why did I get the burn notice? Should I have perhaps used more liquid? Honestly, since you altered the recipe from the recipe I make…I’m not sure exactly why you got the burn error. I’ve never had this issue. The only 2 things I can think of is the difference in using vegetable broth verses chicken broth. Perhaps the type of liquid makes a difference…I honestly don’t know. Perhaps increase the vegetable broth to maybe 2 3/4 cup vegetable broth? Also…make sure steam is not leaking from the silicone sealing ring. Sorry this is not much help but you altered my original recipe so unless I make it the way you made it…I can’t really comment on why your got a burn error. I’m glad it tasted great though! When I made this recipe I did not have chicken broth on hand so used half veggie broth and half water. I guess the veggie broth has a different consistency, so that might be the “burn” culprit? I love the idea of adding some celery (maybe a bit less, who knows, for your burn notice)! Yeah – again if people alter my recipe…totally fine but I can’t guarantee your adjusted recipe will have a success story! Doubled the recipe, could not get my IP to cook it, kept getting “burn” errors even though it wasn’t burning. I eventually threw it on the “rice” setting that cooked it automatically and it was super mushy, maybe the singe batch would work out but i don’t think there is enough liquid in this recipe to double it. Yeah, I can’t say yes or no if doubling this batch will work or not. Rice is very finicky in the Instant Pot and I’ve never doubled this recipe because it makes 12 servings already. When I created this recipe, it was for a single batch, not double so I can’t attest to or guarantee success if the recipe is altered (and/or ingredients) is going to work. The recipe I have published is tried and true. Maybe try it again with a single batch based on how the recipe is written.